Remote management of IIS 7.0 and above through Internet Information Services (IIS) Manager must be explicitly enabled. 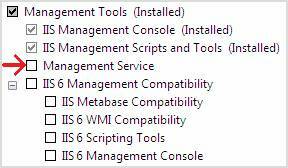 This has changed from IIS 6.0 where IIS Manager remoting was through MMC and was always enabled. This document describes how to enable remote management of IIS on Windows Server® 2008 through IIS Manager. First, you must be on Windows Server 2008. IIS on Windows Vista will not be remotely manageable when it released. You must also be logged in as the built-in Administrator account, or be a member of the Administrators group using elevated privileges. These are the steps for enabling remote administration of your IIS server. Install the Web Management Service (WMSVC). b. IP and domain restrictions. Start WMSVC, and optionally change the service Startup Type from Manual to Automatic. Starting WMSVC is the last step because WMSVC cannot be configured while running. This document only describes how to enable remoting. For an overview of how IIS Manager remoting works, please see the Getting Started with IIS Manager. Click Server Manager in the Start menu, select the Roles node in the left-hand tree view, and scan down to find the Web Server (IIS) role. Click Add Role Services and select the Management Service component. To enable remote connections using IIS Manager, click the server node in the tree view, open the Management Service feature, and check the Enable Remote Connections check box under Remote Connections. Binding – By default, WMSVC is bound to all unassigned IP addresses on port 8172 using a self-signed certificate (WMSVC only communicates over HTTPS). IPv4 Restrictions – After remote connections are enabled, WMSVC accepts connects from any IP address. You may want to refuse connections from a set of known clients, or lock down connections to only a set of known clients. Acceptable for unspecified clients – By default, WMSVC accepts both Windows credentials and IIS Manager credentials (i.e. non-Windows credentials stored in administration.config). You can choose to restrict this to just Windows credentials.